Having studied in Zurich and Paris, Swiss-born Sali Herman arrived in Melbourne in 1937 as a mature post-impressionist artist. This did not prevent his attendance at the George Bell School nor his development of an authentically Australian urban style in Sydney, the city he made his home from 1938. Associated with a circle of artists around Kings Cross, notably William Dobell and intermittently Russell Drysdale, Herman devoted much of his career to representations of inner city architecture and life. 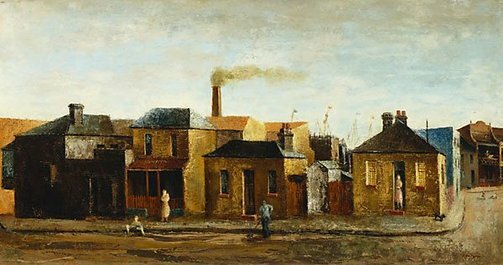 His streetscapes of Paddington, Darlinghurst, Woolloomooloo, Surry Hills and similarly venerable residential and light-industrial precincts form a catalogue of characteristic views comparable to those Maurice Utrillo made of Paris. Near the docks conveys the desultory, almost abandoned beauty of a down-at-heel neighbourhood - Herman's favourite motif. Signed and dated l.r. corner, red oil "S.Herman.49". Bruce James, Art Gallery of New South Wales handbook , 'Australian Collection: Painting and Sculpture', pg. 102-181, Sydney, 1999, 156 (colour illus.). Barry Pearce, Art Gallery of New South Wales handbook , 'Australian', pg. 13-35, Sydney, 1988, 27. City art , Victoria, 1978, 40 (illus. ), 105 (colour illus. ).